IT IS ONE OF THE LARGEST initiatives of its type and feels like a considerable statement of intent. Over the weekend, no less than four places in Manchester opened their doors to major shows from British Asian artists or their counterparts from the sub-continent itself. From the considerable exhibition that is the Raqs Media Collective, at the Whitworth, to the much smaller display of Indian Modernist painters and a Pakistani-born female photographer, who documented their work in Britain, the initiative is wide-ranging covering both the traditional and the new. If contemporary video art appeals then Hetain Patel’s ‘The Jump’ (shown now for the first time in the UK) and new commission, ‘Don’t Look at the Finger’ are playful, and absorbing. In fact, all the artists displaying at Manchester Art Gallery have different and absorbing things to say. On a press trip there on Thursday (September 28), we could but get a glimpse and only a superficial view of this initiative which is part of the overriding #NewNorthSouth scheme created to last three years, with this being the first salvo and pretty much all these exhibitions extending into 2018. Also exploring the possibilities of video art is Neha Choksi, based in LA, her work here, ‘Faith in Fiction’ comprises of huge screens displaying different films of her time at an ashram in Gujarat, which is undergoing refurbishment and is in part a building site. The films are of varying lengths and play out simultaneously. They also have an epic quality and are in many ways a meditation on friendship, personal relations, time and space. In Manchester Gallery too is Waqas Khan, a Pakistani artist whose sense of pulling us closer together is represented by both large scale works and miniatures. A new diptych work ‘Doors’ shows the impact Manchester itself has made on the artist. Also striking and beautiful and what should be a motif for all these artists and their work, is his neon sign Khushamdeed (خوش آمدید), means welcome in Urdu and also finds expression in Persian and Arabic. Essentially, it means a bit more than just welcome as Fareda Khan, head of special projects at Manchester Museums and Galleries, explained. 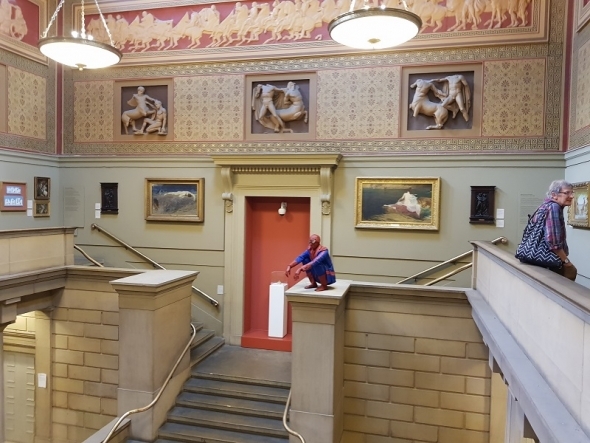 “It is saying leave your baggage at the door – or guns at the door, come inside…” she said only half-jokingly, at the same sign on the exterior of Manchester Museum. It has added significance with the fact that 13 per cent of Manchester’s population is from an ethnic minority and with the famous Rusholme, an area full of Pakistani and Indian restaurants, not far from the museum itself, it should be seen as a way of enticing locals who would not normally step inside a museum or art gallery, to do precisely that, and leave behind any preconceptions or misgivings. Later talking to Khan himself (see our video), he agreed the saying, ‘Khushamdeed’ was like a first act of friendship and when he talks about connectedness and togetherness, it is both simple and affecting (and effective). Highly original is Mehreen Murtaza’s ‘How will you conduct yourself in the company of trees’…this installation, which looks just like a garden, talks… makes sounds and generally feels like being in an enchanted space. Murtaza talks more about this in our video interview. At Manchester Gallery, you can also see Risham Hosain Syed. Based in Lahore, she works across media, using painting, sculpture, textiles and installations. Part of her work displayed at the gallery looks at Manchester’s own political history and the fact that Frederich Engels wrote ‘The Condition of the Working Class in England’ in Manchester and made acute observations about class and geography based on the city’s own layouts. Syed has already documented similar facets of Lahore and the how the one-time colonial capital of Punjab has changed. There is also a section devoted to South Asian design at the gallery; among the exhibitors are two global stars of fashion, Manish Arora and Tarun Tahiliani. A number of British Asian artists feature as do designers from Pakistan. At Manchester Museum, the main new offering is an exhibition by Reena Saini Kallat. Her work has involved looking at Manchester Museum’s own collections – it was the main repository of colonial artefacts from people who lived in the north of England but spent time in Britain’s colonies. Much of her artistic life has been about exploring boundaries and how artificial and arbitrary these can be. Part of this year’s initiative obviously examines Partition and she illustrates the ‘unnatural’ connections, in ‘Half Oxygen’, wires represent a pair of lungs, one half shows banyan, India’s national tree, the other half, the deodar, Pakistan’s national tree. One of her larger works can be seen right at the entrance, ‘Chorus’ is an adaptation of a pre-radar acoustic device – created to listen out for foreign aircraft – but in between the space, what people will find is the sound of birds that actually fly across human-made boundaries. At the Whitworth, by far the largest space is devoted to Raqs Media Collective, ‘Twilight Language’ looking at the urban landscape of Manchester, with politics and philosophy and all manner of thoughtful and stimulating responses thrown in. Based in Delhi, and made up of three – Monica Narula, Jeebesh Bagchi and Shuddabrata Sengupta – their exhibits are striking in range and media and possess an intrinsic playfulness. ‘The Things That Happen When Falling in Love’, an older work from 2010, is arresting, absorbing and has a peculiar beauty. You could also almost say that about ‘Communard Biscuit’ – which Narula explains in our video in more detail and draws dots between Manchester’s industrialisation, the Paris Commune of 1871 and contemporary politics. Also at the Whitworth and taking up just a section of level one is South Asian Modernists 1953-63. Centred around the collection of Victor Musgrave who promoted these artists through his Gallery One in London, the exhibition is small but nevertheless a veritable introduction to art coming out of India and into the West at that time. Among the best known are works by a young MF Husain and Francis Newton Souza and SH Raza. The photographs by the late Ida Kar, who is of Pakistani origin and married to Musgrove add another dimension to the display and contextualise the time and place. Curator Amrita Jhaveri, an expert on contemporary and modern Indian art, gallerist and author, explains why she choose the work she did for this exhibition in our video. Musgrave launched his career in art with Gallery One and just £5. With Monica Kinley, his partner (after Kar), he established the Musgrave Kinley Outsider Art Collection, which is owned and managed by the Whitworth. There are a number of talks and events regarding all the above – best to look at the websites of each to find out more. Part of this initiative, known as #NewNorthSouth, was in train on Sunday (if you’ll excuse the pun). Performance artist Nikhil Chopra’s 48-hour ‘display’ – ‘Blackening 3157’ beside an old Pakistani Railways locomotive, no. 3157 and built and first run on railways in the northwest adn then on Pakistan Railways, ended yesterday (October 1), but you will still be able to see the locomotive alongside other carriages in display at the museum. Dancing, drawing, interacting with the audience was all part of the charm, said Chopra, explaining what he was going to do when the press met him on Thursday (September 28) prior to his performance. New North and South, the name and umbrella project under which all this has been made possible was set up with these partners: Manchester Art Gallery; Manchester Museum; The Tetley, Leeds; The Whitworth, Manchester; Colombo Art Biennele Sri Lanka; Dhaka Art Summit, Bangladesh; Kochi-Muziris Biennele, India; Lahore Biennale 01, Pakistan; and Liverpool Biennial. The work is supported through national funding from the National Lottery Through Arts Council England’s Ambition for Excellence programme and to coincide with the 70th anniversary of India and Pakistan independence. Entry to all these exhibitions is FREE! All the above exhibitions started this weekend (September 30) and continue until February 2018 – best to check individual details online.